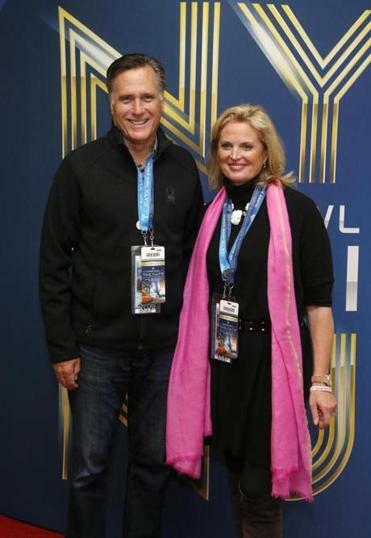 Former presidential candidate Mitt Romney and his wife, Ann, arrived for the Super Bowl earlier this month. WASHINGTON – Ask Mitt Romney if he would run for president a third time, and he will deny it every which way. “I’ve had my turn,” he told CNN. “We’re so ready to watch the next person step up and take that nomination,” his wife told Fox News. “Oh, no, no, no. No, no, no, no, no. No, no, no,” Romney told The New York Times. But in recent weeks, a strange thing has happened: Some supporters and donors, pollsters and pundits are starting to suggest — without irony — that the former Massachusetts governor run for president in 2016. Kaufman made clear that there was no behind-the-scenes maneuvering to persuade Romney to run again. A second Romney adviser said he was also approached frequently by former supporters and donors, asking him to persuade Romney to run again in 2016. Those close to Romney say he is giving the talk little thought, and party operatives in key states and some of his former advisers say they cannot imagine a scenario in which he would run. And yet the former candidate who rarely gave interviews during the 2012 campaign and laid low for the year following his defeat is now suddenly everywhere. There’s the new “MITT” documentary on Netflix, which was a well-received portrayal of the candidate and inner workings of his losing campaign. He did a “slow jam” of the news with late-night comedian Jimmy Fallon, displaying a looseness and a wry humor he rarely let show in public. He showed up at the Super Bowl (“It’s great to . . . come in here and celebrate a great sport,” he said). He was recently on CNN discussing the Olympics, and on Fox News talking about health care. And on Sunday he’ll be on NBC’s “Meet the Press,” his second appearance on the show in the past three months. Romney’s public relations makeover and higher profile have come at a time when mainstream Republicans are searching for a strong party patriarch. Some party activists blanch at the prospect of a presidential field dominated by Tea Party movement favorites like Senators Ted Cruz of Texas and Rand Paul of Kentucky. New Jersey Governor Chris Christie, a favorite among mainstream Republicans, has been knocked off kilter by a controversy over a traffic jam at a George Washington Bridge toll plaza caused by lane closures ordered up by Christie’s administration. Critics say the closure was an act of political retribution on the Democratic mayor in Fort Lee, N.J., who had refused to endorse Christie. Jeb Bush, former governor of Florida, has also not said whether he would run, and Representative Paul Ryan of Wisconsin seems focused on accumulating power in Congress. Romney is planning to host another policy retreat this June, where he invites top business and political leaders to spend several days with him in Park City, Utah. Former Romney advisers expect his potential candidacy could be a major topic if a more mainstream presidential candidate has not emerged. But Romney would face major hurdles. He struggled with the Tea Party, a movement that remains a potent force in Republican politics. And while he has appeared far more comfortable in recent public appearances, it has come at a time when he has not felt the pressure of running for office and making a gaffe that can dominate several news cycles. One of the biggest hurdles would be convincing party officials and donors that he deserves yet another chance. The last candidate to win his party’s nomination a second time was Richard M. Nixon, who after losing the 1960 election to John F. Kennedy was nominated again in 1968 and defeated Hubert Humphrey to win the White House. Romney supporters have pointed to another historical example: Ronald Reagan ran three times (though he was not the party’s nominee until his third try). Supporters also note that Romney, who is now 66, would be 69 years old in 2016 — the same age as Reagan when he was sworn into his first term. The day after Romney lost in 2012, a Facebook page was started called “Mitt Romney for President 2016.” “My ‘Romney’ sign is ready to put on my front lawn. Just need to hear he is running. I saved it from the last election,” said one post. “Please run again Mr. Romney. I think America has learned!” said another. Still, the page has only 1,469 likes — not even enough to win some Iowa counties. The buzz around Romney running was sufficient enough that Purple Strategies, a Virginia-based firm, included Romney in a poll of New Hampshire voters three weeks ago. He came out on top, with 25 percent, among Republican primary voters. Yet Republican activists in early primary states say they have a hard time imagining a Romney run. “I don’t think anyone is taking the prospect of him running again seriously at all,” said Fergus Cullen, a former chairman of the New Hampshire Republican Party. Until recently, Romney had kept a fairly low profile since losing the November 2012 election. He still has a condominium in Belmont, but also owns homes in Utah, California, and New Hampshire. He mostly spent his time with his extended family, weighing in only occasionally on current events and quietly trying to rebuild his reputation as an elder statesman in his own party. The answers Romney has given more recently are more definitive than the ones he gave last year. He told CNN in June that he would “love” to run. His family tells stories about how they took a vote on whether Romney should run in 2012, and only two people voted yes, neither of them named Mitt. Former Romney advisers say he would have to be persuaded to run again. And unlike four years ago, he has not done anything to prepare for a presidential run and seems to recognize how hard it would be to mount another bid. In a scene from the recent documentary, Romney tells donors that nominees who lose the general election “become a loser for life . . . it’s over.” He then makes an “L” shape with his fingers, and holds it in front of his forehead.